My family went to Mass this weekend, it was a real treat for me as I got to listen to the readings and homily without distraction! Of course that means my wife was wrangling our 17 month old son in the crying room and my 4 year old was at the children’s liturgy. Since I didn’t have to juggle Cheerios and quietly answer each question or shush each giggle or whine, I was able to spend a good bit of time immersing myself in the Word of God. Since it had been another busy week at Joseph’s House- as most of them are- and once again seemed particularly draining- as many of them are, this was a much needed blessing. This weekend’s Gospel reading is one of my favorites. There are a few reasons this particular reading has always appealed to me. First, you have the beautiful image of the crowd. This quote brings to mind the concerts I’ve been to where the crowd becomes so entrenched in the performance they continually try to get closer, to push further, so they can more fully get the most from the experience. I imagine the crowds listening to Jesus teaching had a similar experience. Hanging on each of his words and being so fully consumed by his teaching, those gathered kept pressing closer and closer. 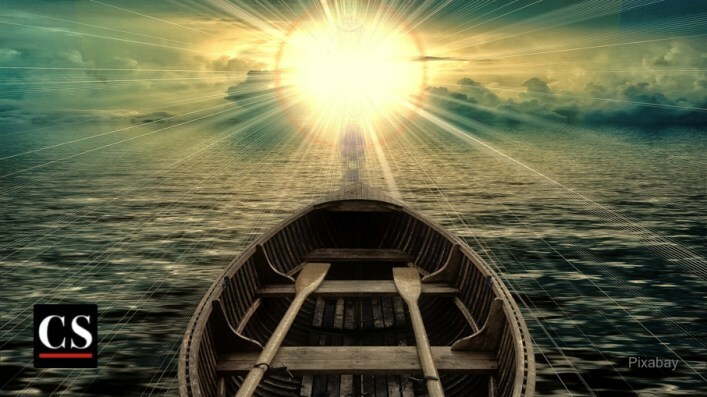 They pressed so very close, Jesus had to get into a boat and “put out a short distance” and began teaching from the boat. One can easily imagine His voice radiating across the water in symphonic ripples reaching the hearts and souls of all who continued to gather in the growing crowd. Such a beautiful image to contemplate. When Jesus tells Simon to go into the deep water and lower his nets, Simon’s first instinct is to almost say “We’ve tried that, we’ve worked hard all night and have caught nothing.” You can almost imagine the thought was accompanied by an eye roll or a shoulder shrug. But Simon acquiesces. I’m reminded of this story often in my daily life as well as at Joseph’s House when I find myself getting caught in the pattern of “we’ve tried that” or “I already attempted that” or “that won’t work.” It’s a dangerous pattern in which to fall. The first part of this verse “Put out in deep water” is a call for something more. A call to go the extra mile, to go where it’s uncomfortable, to push the limits and go out on a limb. The deep waters are where it’s rough. The waves are bigger and more dangerous. It undoubtedly takes longer and requires more patience to navigate the deep rather than the shallow. Going into the deep water makes one stretch the boundaries of their solace, beliefs and talents so it always feels easier and safer to stay where the waters are peaceful, calm and shallow, to stay within the cocoon of familiarity where one always knows exactly what to think, to do and to say. The end of this passage could easily be over looked, but remember the Apostles were so overcome with what had happened, they went on to follow Jesus. They not only went to follow Jesus but they “left everything.” They had just finished probably the most successful fishing trip of their lives and they left it all behind for Jesus. How many would have thought “Great! Now we know where we can get more fish and grow our business! Now we know how we can be more successful!” Instead, the Apostles left it all behind to follow Jesus. Perhaps this is another way we can “put out into the deep water” or answer the call to step out in faith. Abandoning ourselves and our personal fulfillment and surrendering ourselves to the greater glory of God.